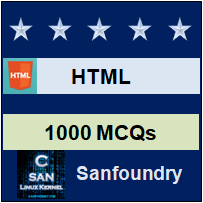 This set of HTML Multiple Choice Questions & Answers (MCQs) focuses on “HTML5 Introduction – 1”. 1. Which feature was already introduced before HTML5? Explanation: Until recently you could not draw on the web and graphics were not very interactive but canvas/SVG which were introduced by HTML5 solved all the problems. Video, Geolocation were also new features introduced by HTML5. Frames were already there before the launch of HTML5. Explanation: <canvas> tag is basically used for graphics via scripting i.e. usually with Java Script (scripting language, basically used to create animations). Other tags like <table>, <article>, <footer> can be used simply with HTML. 3. What application can one create even before the introduction of HTML5? 4. What is the correct syntax of doctype in HTML5? Explanation: The correct syntax of HTML5 doctype is <!doctype html>, doctype is the very first thing to write in HTML5. <!doctype html> or <!DOCTYPE HTML> both are same because ‘doctype’ keyword is not case sensitive. 5. What if one does not use the doctype in the starting of HTML document? Explanation: If the browser finds <!doctype html> in the starting of an HTML document it sets the document in standard mode but if one does not use a doctype, the browser goes to quirky mode. In this mode, certain content will not be displayed as per one wrote that. So it is always recommended to write a doctype at the very start of the HTML document. 6. Which of the following is not semantic element for text in HTML5? Explanation: Semantic elements used for text are <mark>, <time>, <wbr> whereas <article>, <aside>, <figure>, <footer>, <header> etc. are the semantic elements for structuring a page in HTML5. 7. Which tag supports Non-English language? Explanation: <bdo>, <rp>, <rt>, <ruby> are some tags which support Non-English language. <input> is for web forms and <audio>, <embed> are the tags for audio and plug-ins. 8. Which element was not removed by HTML5? Explanation: Although HTML5 adds new elements, it also kicked out some old elements like <big>, <center>, <font>, <tt>, <strike>. HTML5 adapted many elements also <small> is one among these. The <small> element represents “small print”.